In order to fully evaluate and appreciate the background to the Vauxhall Cavalier MK1 it is necessary to evaluate two separate and very distinct timelines. The first is the financial & forward model programme at Vauxhall in Britain along with prevailing economic situation in the country, and second the initial design & development work on the General Motors U Car programme carried out by Opel in Russelsheim Germany which was the planned replacement for the Ascona & Manta A originally launched in 1970. Vauxhalls financial position, forward model programme and the economic conditions in Britain – the downward spiral of net profits at Vauxhall had begun in 1969 with a £2.057m loss, this increased to £9.706m in 1970 which was the largest in Vauxhalls history and resulted in the departure of David Hegland as Managing Director. 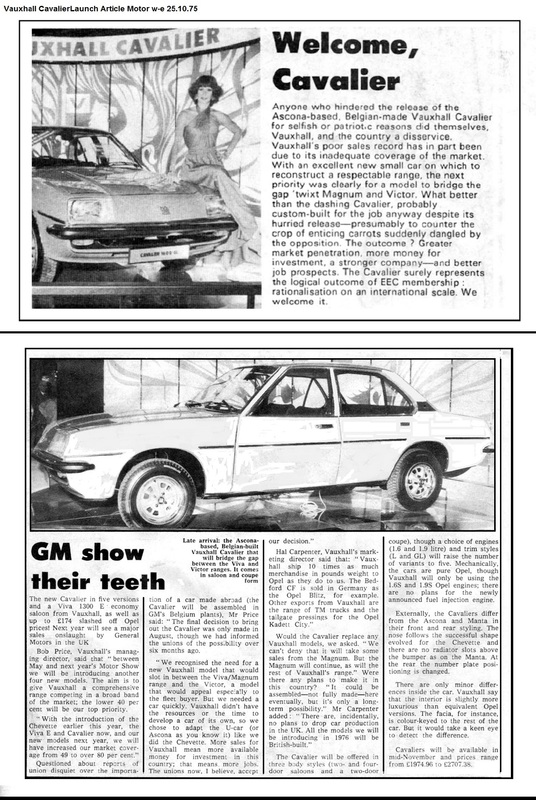 Replaced by Alex Rhea as MD, Vauxhall made a small profit of £2.613m in 1971 but slipped back in the red by £4.333m in 1972, £4.088m in 1973 and a massive £17.557 in 1974 but before the end of the year Rhea too was ditched and replaced by GM turnaround supremo Bob Price in April. This trail of losses would have a huge impact on the Cavalier development, and yet another further loss of £12.7m was also posted for 1975. Since before WWII Vauxhall had gained an enviable reputation in the British car industry for excellent industrial relations and relatively strike free production, however the general industry wide, indeed nationwide, deterioration in industrial relations had started to impact Vauxhall and by the early 1970s it was becoming a major issue to the company’s continued viability and also on the quality of manufacture. By mid-1972 Vauxhall were relying on 2 basic cars for all sales – the successful Viva HC range (including the sales flop Firenza) and the FE Victor VX4/90 & Ventora which had launched to an underwhelming reception in February 1972. The Chevette was in development but wouldn’t be ready for launch until early 1975, a facelifted & revised FE was planned but all available funds, and there wasn’t much, were being ploughed into the Chevette programme. The Vauxhall range, even with the Chevette, had a gaping hole where the Ford Cortina was selling like it had no right to, work had already started on the Viva HC replacement, the HD, in 1972 headed up by Vauxhall’s new Design Director Ed Taylor & Assistant Director Wayne Cherry with Chief Engineer for passenger cars Doug Bull. The plan was to move the Viva HD upmarket in size and price to compete in the mid-range head on with the Ford Cortina and increase Vauxhall’s share of the bourgeoning company car market, the target launch date was late 1975 and a name change from Viva was also being planned – the styling mock-ups were badged Ceibus. The move up in size would then leave room for the planned Chevette to slot in underneath in the range and which was due to begin production early in 1975, which it did. Several HD mock ups were built, all featuring the yet to be familiar droop snoot front end style, but the whole project was canned in Summer 1973 after the disastrous Canadian sales experience of the HC which signalled the end of Vauxhall operating as an independent division within GM. Also by this time Vauxhall sales in Britain and Europe were in freefall and the need for a new mid-range model was getting desperate. Most of these problems were self-inflicted but the 1973 fuel crisis and 3 day week certainly wasn’t but just added to Vauxhalls problems. Initial design & development work on the GM U Car programme by Opel - The original Opel Ascona & Manta A was one of the last car programmes to be designed under Opel Design Director Henry Haga, in 1970 Haga returned to GM Design in Detroit and was replaced by David Holls. Almost simultaneously, one of Opel’s Assistant Design Directors, Ed Taylor, left to become Director of Design at Vauxhall in Luton replacing David Jones who had retired early. The GM U Car programme started in Russelsheim during the early part of 1971 with the aim of moving the Ascona into direct competition with the Ford Taunus. To achieve this the car was 3.5ims longer, 1ins wider and a wheelbase stretched by 3.35ins. A wide range of engines was planned to be carried over with little change from the previous model along with the same transmission options. A 2-door coupe was included to replace the popular Manta but there were no plans for a direct replacement for the slow selling Ascona Caravan estate. Exports to the US market were initially planned, where Opel models were sold through Buick dealers, but dropped in 1973 for the new cars. From 1975 onwards the Opel cars sold by Buick would be rebadged Isuzu models built in Japan. Prototypes were evaluated by Holden in Australia but found the car to be unable to cope with conditions down under without some serious chassis modifications and, in any event, they were already covering the U car’s sector of the market with their own similarly styled design – the LH Holden Torana - launched in 1974. So, from 1973 onwards the U Car was a Europe only programme, with styling that followed general GM worldwide design trends except for the front end of the new Manta which was planned to use a very Vauxhall influenced “droop snoot” with the addition of 2 oblong vents. After the cancelation of the HD Viva programme in the Summer of 1973, and following GM Executive decisions made in Detroit, Vauxhall were brought into the U Car development project on the basis that the main vehicle architecture that Opel had already developed for the car would be used by Vauxhall but with specific front & rear styling and interior by the Luton Design Department to give the Vauxhall a unique and separate identity to the Opel Ascona & Manta B models, there was also an open option to use the Opel mechanical components if required. 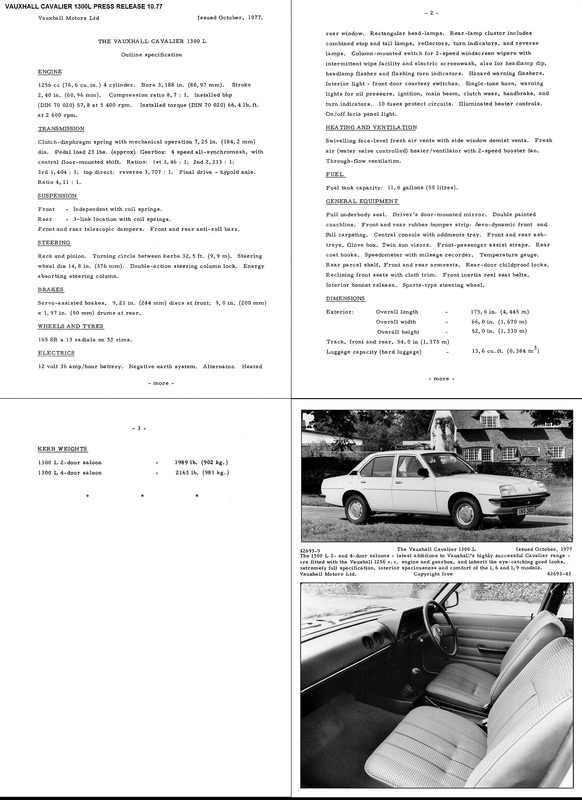 This was a more substantial extension to what had been achieved with the Viva HA & Opel Kadett A and alter with the Victor FE & Opel Rekord D. For General Motors this was nothing new, it had been standard practice in the US since the 1960s, although by the 1970s it was being viewed negatively by a cynical motoring press. Vauxhall started work on their own variation of the Opel U Car design and by April 1974 the Design Department had produced their second concept which was stunningly attractive and coincided with the appointment of Bob Price as Managing Director. Price was impressed by the U Car Concept but it would require a large number of specific parts & panels as well as items for the proposed new interior. 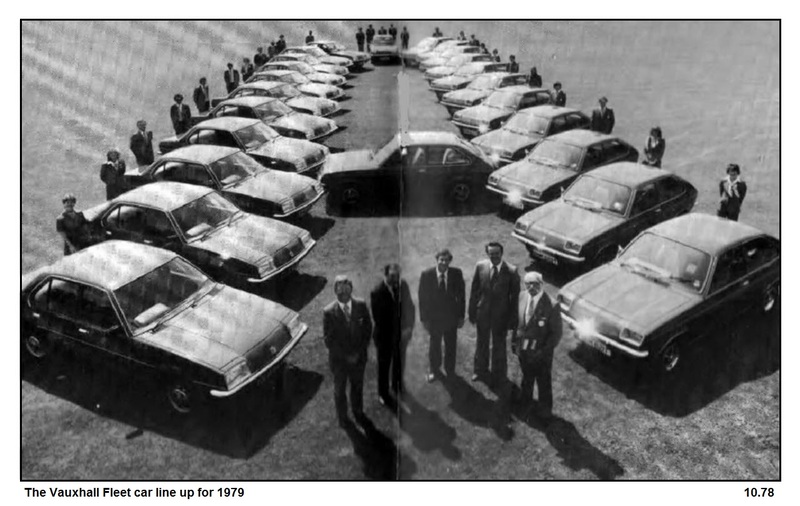 The target introduction date was October 1977, this was accepted as realistic for what would be required but Price was concerned at the huge financial losses building up and also the continued drop in Vauxhall sales at home & abroad. A further review requested the Design Department revise the U Car Concept to make it more production friendly using fewer Vauxhall specific parts and therefore reducing the lead time to production. This was done and a third U Car Concept in 2 & 4 door variations was built. The car retained a significantly different appearance to the Opel version but the estimated introduction date was still early 1977. 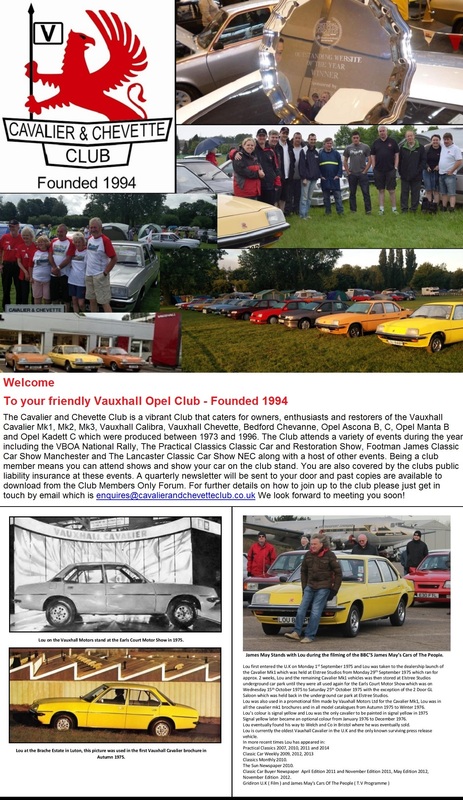 In March 1975, the Vauxhall Chevette was launched to extremely positive reviews even though there was a number of Opel components used in the car, Vauxhall dealers were swamped with orders for the car even before it went on public sale. Unfortunately, the financial position Vauxhall faced was worsening with another huge loss posted for 1974. 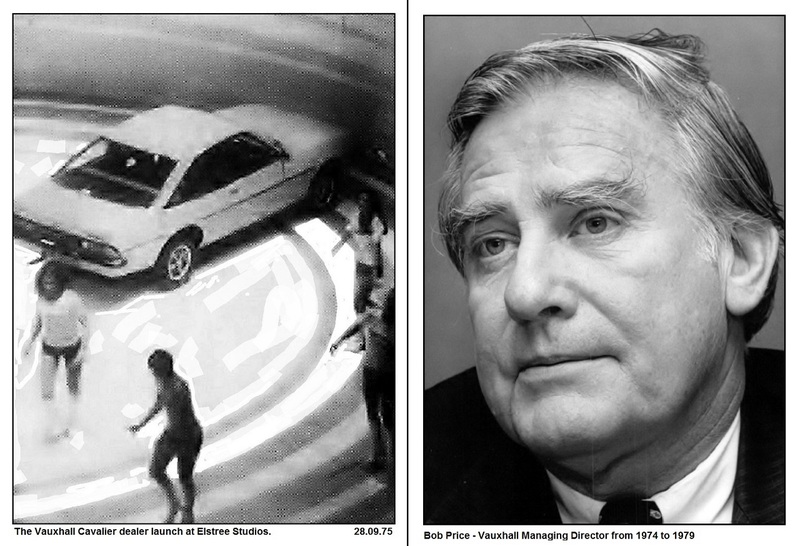 Bob Price acted quickly, in a special closed meeting of the Vauxhall Board of Directors in April 1975 he announced the Company would launch a new mid-range car at the Motor Show in October, just six months away. Price further stunned his fellow Directors by detailing how it was going to be achieved. Price had already tasked the Design Department to come up with a variation of the Opel U Car that utilized the minimum of body changes to achieve a Vauxhall look to the car. This was achieved using the standard Manta B front panel & headlight units without the 2 vents, easily done as the nostrils were punched in after the original pressing had been done, and with a Griffin badge mounted centrally. The panel between the rear lights would be painted silver or matt black with separate VAUXHALL lettering and the number plate re-located below the bumper. Price had previously been in charge of GM Continental and was fully aware of the flexibility of the Antwerp production plant and so, to the pure disbelief of his audience, Price stated that at least initially the car would be imported fully assembled from Belgium. Antwerp was also the preferred option because of reduced shipping costs to the UK and a more favourable exchange rate than Bocham in Germany. The name that the Design Department had chosen for their work was Cavalier and this was agreed at the meeting to be the name for the new car. 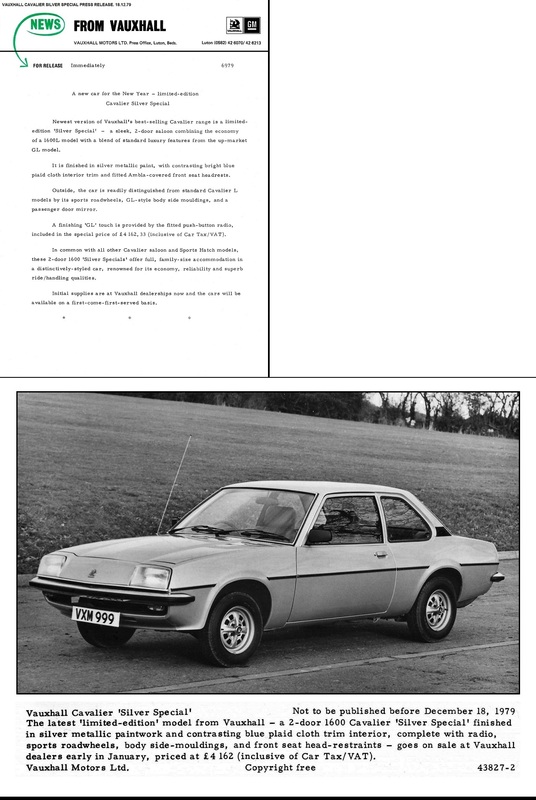 The specification for the Cavalier would be to Vauxhall requirements from the planned regular production options for the Ascona & Manta B build, the car would be available in 2 & 4 door Saloon versions with the Opel CIH 1.6S engine as standard and the 1.9S optional. Trim levels would match the Ford Cortina in L and GL forms with the 2 door Coupe version in GL trim only. Pricing would also match Fords Cortina to within a few pounds. The shocked Directors left the meeting with plenty to keep them busy but all were sworn to secrecy, this was primarily because there was going to be some delicate & difficult negotiations with the trades unions representing Vauxhalls British workforce before the Cavalier could be launched. The announcement of the Chevette with so many Opel parts had made the unions very twitchy about what General Motors future intensions were for Vauxhall in the UK. Bob Price led the negotiations himself and in fact these were not fully concluded until the day before the Motor Show Press Day. As Price would later state in an interview “General Motors is hardly the smallest company in the World and if we really pushed we could have had our own car but this saved 3 years development and £50m”. 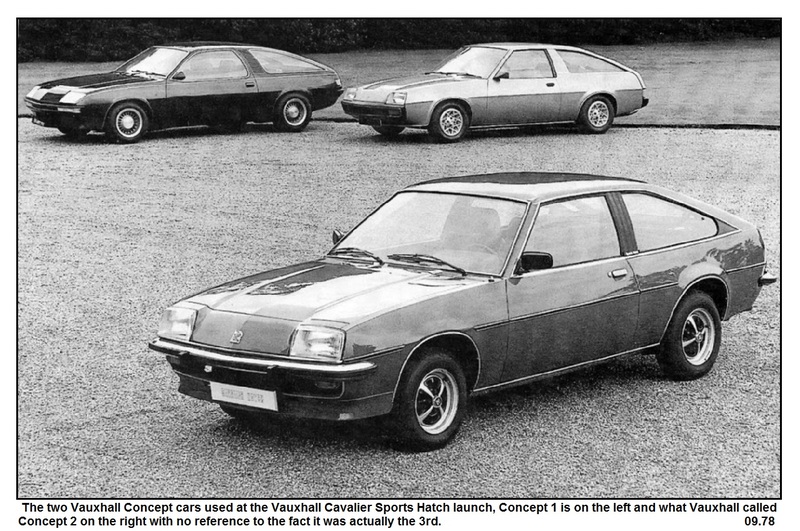 With assurances from Price that Cavalier assembly would move to Vauxhall at Luton as soon as practicable they reluctantly gave the go ahead for the public launch of the car. 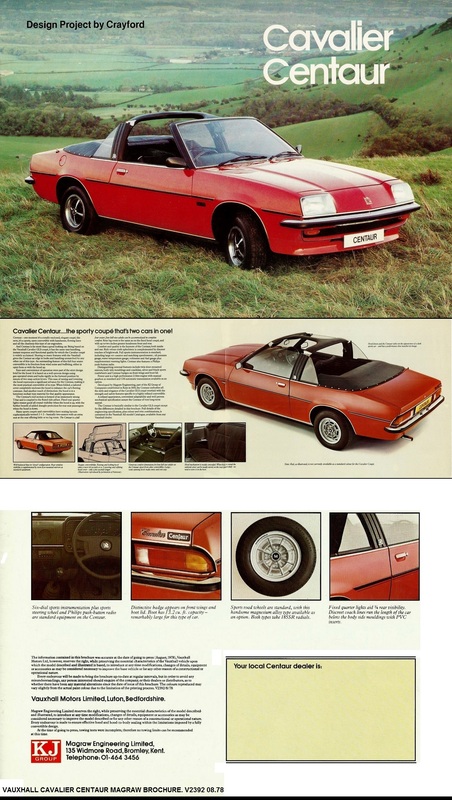 Europe and the Cavalier was a European car that was right for Britain. Vauxhall Executives, including Bob Price and John Butterfield, made a great play on the fact Britain was part of Europe, that Britain had voted to remain part of the EEC just over a year earlier, and the "we are all Europeans now" message was rammed home at every opportunity. 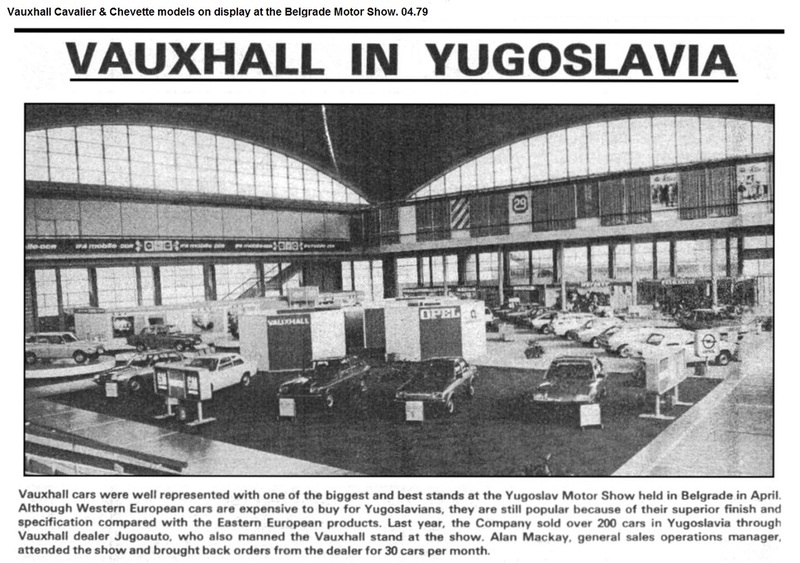 However, the situation was made even more controversial by headlines such in the Daily Mail on 10 October 1975 "Stop This Foreign British Car" and even the Financial Times on the same day stated that Vauxhall "would be closed within months". Even executives from Ford & BL were concerned at the trend that was being set. Not all dealers were convinced either with many voicing doubts that the Cavalier would be accepted by the exceptionally conservative & patriotic fleet operators at the time. After the dealer launch the cars were put back under cover and moved back to Luton to be made ready for transfer to Earls Court for the London Motor Show. So fluid were the circumstances surrounding the Vauxhall Cavalier launch that exact models mix for the new range of cars was not confirmed until just before the start of the Motor Show and one car, the Cavalier 1600GL 2 door Saloon was pulled at the last minute and left in the basement car park at Earls Court. In the nick of time the Cavalier was successfully launched and was the star attraction on the Vauxhall stand with a spectacular back drop of a large red Griffin surrounded by flames, Bob Price was on hand to answer the inevitable awkward questions from motoring journalists. It is not clear how much GM (UK) Ltd the importer for Opel in Britain knew about the Vauxhall Cavalier launch because on the opening day of the show they announced price reductions for the Opel Ascona & Manta, they stated that the price cuts were a planned response to market conditions – but nobody was going to believe that! In 1976 the Engineering Department at Luton fitted two Cavalier Coupe models with the 2.3litre slant four engine, one was a twin carburettor the other used Bosch fuel injection system. Neither project progressed any further. The Design Department were not idle either, a very attractive Bedford Cavalier Van was proposed along the same principles as the Bedford Chevanne, designed to appeal to up market van users rather than an out and out workhorse vehicle like the Bedford HA Van. One prototype was built and evaluated but was rejected as there was deemed insufficient demand with no Estate version with which to spread the tooling costs. The Chevanne was below it in price and the Opel Rekord van was above and Rekord van sales were tiny in the UK so the idea was dropped. 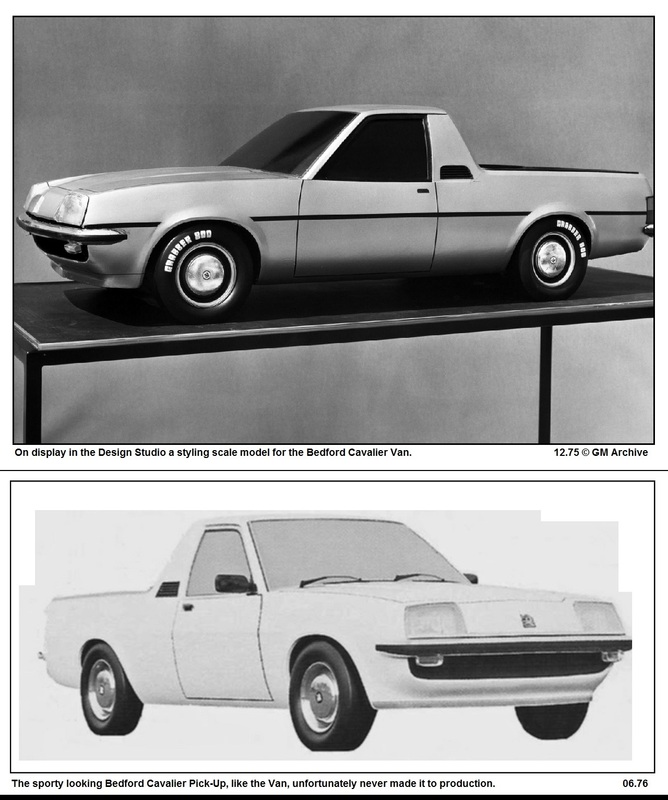 Designed alongside the Bedford Cavalier Van was also a Bedford Cavalier Pick-Up. Bedford were keen to compete with the increasing volume of Japanese imports of pick-up trucks as well as the P100 which Ford were considering importing from South Africa. Again, a prototype was built and evaluated but was considered too “delicate” for the type of use it was aimed at. Ironically, GM in South Africa were interested in producing it but wanted to replace the rear suspension with a beefier set up using leaf rear springs, unfortunately the costs involved meant the project was eventually dropped. The other project that didn’t get beyond the studio mock up stage was the extremely good looking Cavalier 5 door Estate. Although Vauxhall were keen to plug an obvious gap in the Cavalier range, and also to match the Cortina in Britain, Opel saw no need for the car as they felt the market was adequately covered by the Kadett / Chevette Estate and the larger Rekord / Carlton Estate so it would mean Vauxhall going it alone and on that basis the investment could not be recouped within the lifespan of the car, ironically the Mk2 Cavalier Estate which Vauxhall built in collaboration with Holden was far from a success. The reason for a separate section for the Vauxhall Cavalier Sports Hatch is that the origins of the idea of a “Sports Hatch” concept at Vauxhall dates back long before the Company became involved in the U Car programme. When the HC Viva 2300SL Estate was launched in 1972 many motoring journalists branded it the poor man’s Scimitar GTE, this was referring to the Reliant Scimitar GTE - where “GTE” stood for Grand Touring Estate. It was a fair comment, the Viva 2300SL Estate was a fast – fastback styled – 3 door estate that the family motorist could afford. However, what none of these journalists knew at the time was the concept of a sporty, fast, practical and stylish “sports hatch” was very much alive & well inside the Vauxhall Design Department and had been for some time. In 1969 as part of the MK2 HB Viva GT revisions for the 1970MY an estate version was seriously being considered, unfortunately, at the time Reliant had trademark use of the GTE name so if it had happened it wouldn’t have been called Viva GTE. 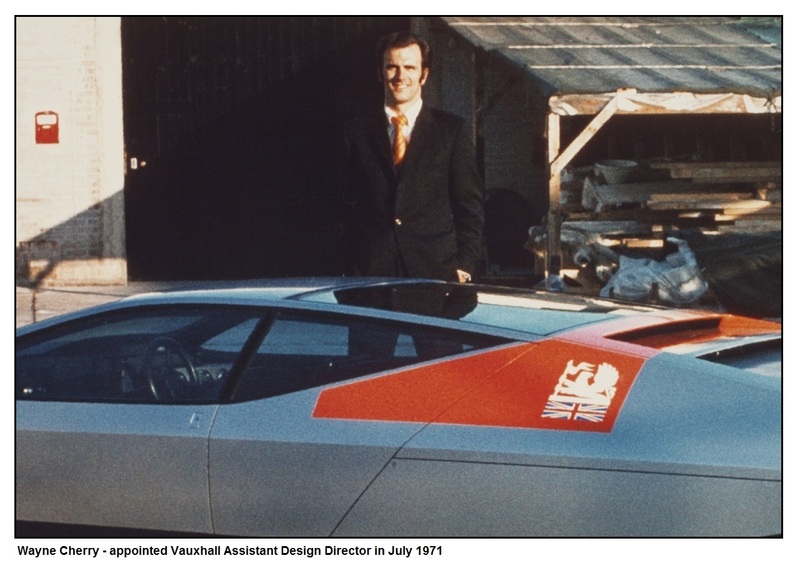 One of the main protagonists of the Sports Hatch concept within the Vauxhall Design Department was Wayne Cherry who was promoted to Assistant Design Director for Vauxhall on 01 March 1971. As a parallel programme to the HD replacement for the Viva HC the first proper sports hatch design sketches were started in early 1972 and the first clay mock-up completed in July 1972. The aerodynamic proposal envisaged using pop up headlights and featured a futuristic style with a large glass area. The mock-up was photographed with an Opel Manta, Viva HC Estate and HC Firenza for comparison, why? The idea was to combine the advantages of all three in one design. Despite the proposal being planned around the HD packaging and the fact that the HD programme was cancelled in the Summer of 1973 a full-size styling model was made and completed in September 1973. Later christened Concept 1, the car was a masterpiece of design and years ahead of its time in styling and showcased advanced thinking such as digital instruments and the soon to be seen “droop snoot” front facia. Concept 1 was, like all Vauxhall styling mock-ups, built to a very high standard with the interior and exterior defined in exquisite detail and quality. The car was also a classic example of what Wayne Cherry called DRG Down the Road Graphics, which put simply was how the car would look coming towards you or in your rear-view mirror, in both cases Concept 1 would have looked both impressive and imposing. Having devoted so much time, effort and presumably money into the car it is amazing Vauxhall didn’t show it publicly. 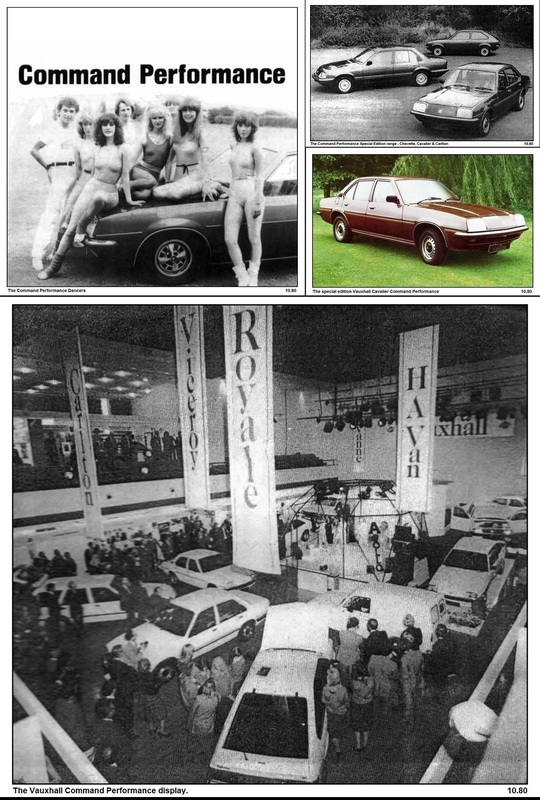 As a means of wowing motor show crowds, it would have few matches, strangely one photograph was published in 1977 for a special Vauxhall supplement in Motor magazine but was cited blandly as a design concept presumably because the Cavalier Sports Hatch was yet to be launched. It is at this point that the Sports Hatch history becomes a little complicated. To simplify the story, the next Sports Hatch concept is referred to as Concept 2 the complication will become clear later in the timeline. Concept 2 was specifically conceived around the proposed U Car dimensions, Vauxhall were part of the programme along with Opel in Germany and were already busy designing their own variation on the Saloon & Coupe body styles. 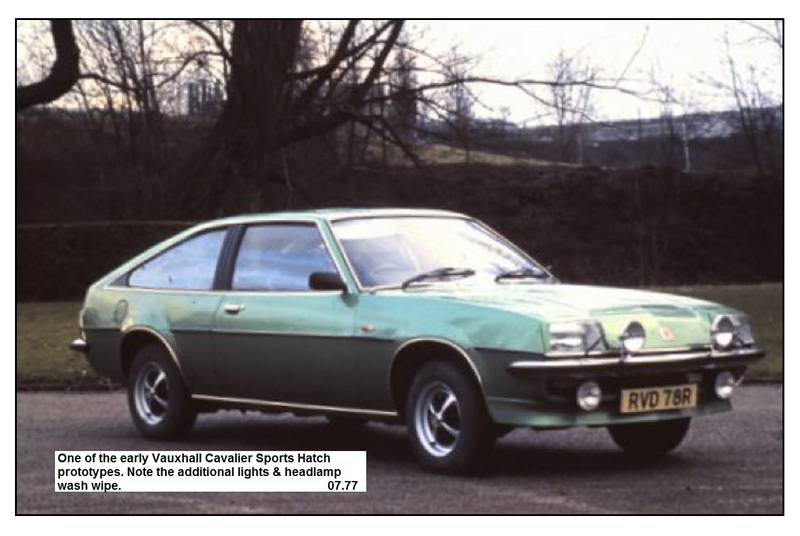 However, Vauxhall were the only ones working on a “sports hatch” version and the first clay mock- up was completed in November 1973. The HP Firenza had been seen for the first time in October at the London Motor Show which gave the public their first sight of the new Vauxhall droop snoot nose cone. 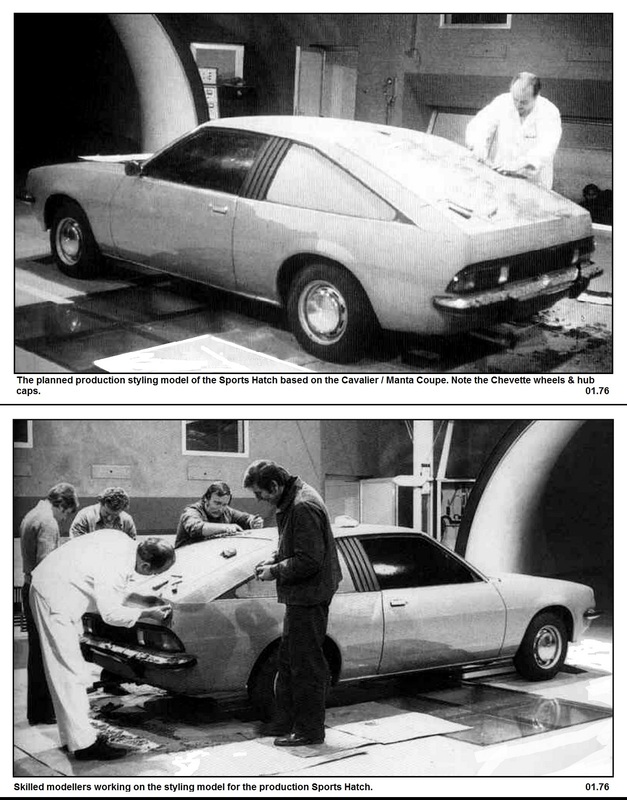 The clay mock-up of Concept 2 featured a front treatment that had been used on some previous Firenza concepts with four square headlamps from the FE Ventora & VX4/90. By January 1974 this had been dropped and replaced by a nose cone similar to that of the production HP Firenza. Unlike Concept 1, the second used the same centre pillar design both sides but window outline was the same if a little shorter. In order to use U Car size doors an additional quarter window was added next to the centre pillar. At the rear, the styling was also similar to Concept 1 but used lower mounted light units with a larger bumper finished off with a Griffin badge in the centre. Following a Management review the go-ahead was given for a full-size styling model. Completed in April 1974 the styling model of the Concept 2 clay mock-up was sprayed bright red and fully trimmed inside, it looked truly stunning as well as being as realistic as possible. The dashboard was uniquely designed by Vauxhall but its layout of handbrake, air vents & heater controls matched those of the U Car exactly. Unlike Concept 1 the instruments proposed were analogue not digital and the interior was in a more tasteful beige crushed velour and leather. Rear seating was split and the centre console still ran from the front lower dashboard through o the rear compartment which housed an ashtray along with a storage compartment under the armrest. It is at this stage that the complications in the history begin. By August 1974 the Concept 2 underwent some design changes to the rear styling which were probably to use as much U Car architecture as possible. The tailgate was lengthened so as one piece it reached right down to bumper level, with the rear light units moved and incorporated into the bumper. The car was also resprayed in the same dark maroon metallic paint used on Concept 1. Changing the colour did nothing to retract from the cars appearance but the changes at the rear may have been necessary but didn’t look as good as the previous design. The two cars are shown photographed side by side in the Design Department at Luton below. Curiously, Concept 2 appears to have been broken up as there are no further visual records available but in November 1974 a new clay mock-up was completed, Advanced Experimental Design-347, which in large part was near identical to Concept 2 apart from the almost production ready nose-cone. The clay model used two different window designs, on the RH side the same arrangement as Concept 2 was used but the LH side featured a revised centre pillar that did away with the need for the additional quarter window. The front bumper was integrated with the lower panel & air intake design and housed the auxiliary light units, white wheels are fitted to the LH and painted versions of the same style on the RH. At the rear, the lights & VAUXHALL lettering were all part of the bumper moulding, as before, but were now surrounded by a chrome moulding but still looking very similar to Concept 2. Concept 1 is used for comparison in the images but close examination of the photographs has also revealed a U Car line drawing for a 5-door hatchback version on the wall. Following evaluation of the new clay mock-up a full-size styling model was commissioned and build completed in February 1975. For simplicity, this will be referred to as Concept 3 and was painted bright yellow and featured the wider centre pillar with no additional quarter window on both sides. A small script style Sports Hatch badge was fitted at the base of the centre pillar. The rear end design was altered again and now used a larger bumper extending much lower under the car, the number plate mounting was now between the rear lights with no chrome mouldings or Vauxhall badges. The only embellishment was a chrome strip on the bottom lip of the tailgate. Inside the Concept 3 used most of the dashboard, seating & trim from Concept 2. The final changes to Concept 3 were completed in May 1975 and were mainly small cosmetic tweaks, the front bumper moulding was altered to fit closer to the front panel and the chrome wheel arch mouldings extended under the front along the chin spoiler. Up to this point in time, Vauxhall were alone in working on any form of Estate or Hatchback version of the U Car as Opel had no interest in such variations. However, car manufacturers across Europe were all launching hatchback vehicles of all types and sizes and the success of the Vauxhall Chevette & Kadett City forced Opel to reconsider their position. The Opel Design Centre in Russelsheim took up the project that Vauxhall had started with the Sports Hatch and began work on a fully production ready version of the Vauxhall Concept car in January 1976. 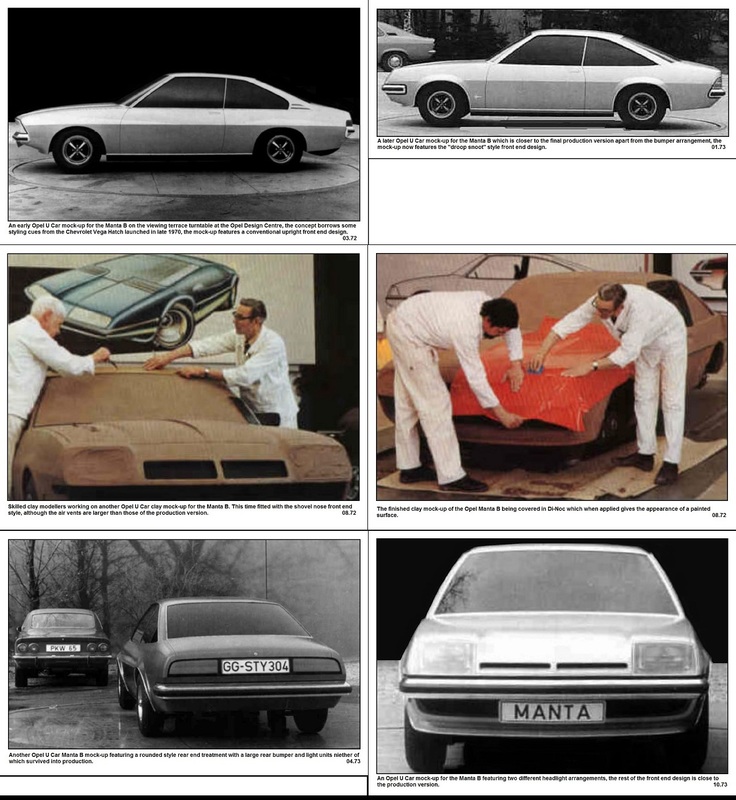 In May 1977, a fully road going LHD prototype Opel Manta Hatch was shipped to the Vauxhall Design Department and was adapted to the specification of the Cavalier 2000GLS Sports Hatch shown in the photographs below, although the engine fitted was actually still the 1900cc version. 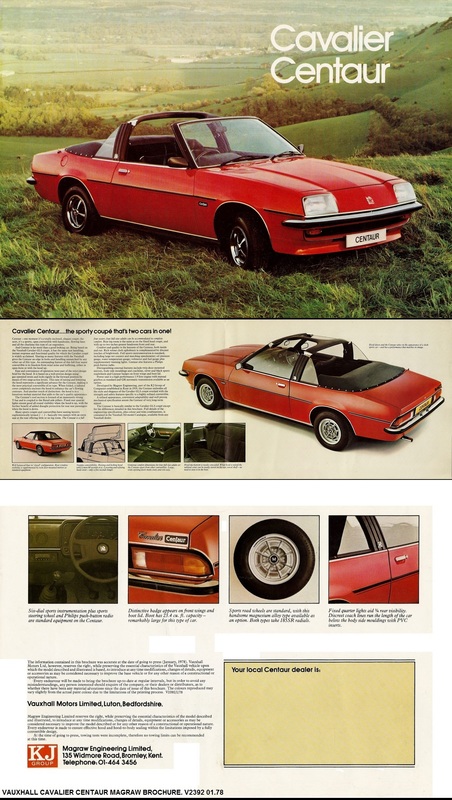 The front was identical to the Cavalier GLS Coupe, the rear was modified with a flush matt black panel between the rear lights which carried the Vauxhall lettering, this didn’t make it to the production version. Further prototypes were delivered and endurance testing began using the new Sports Hatch body and the new 2000 engine. 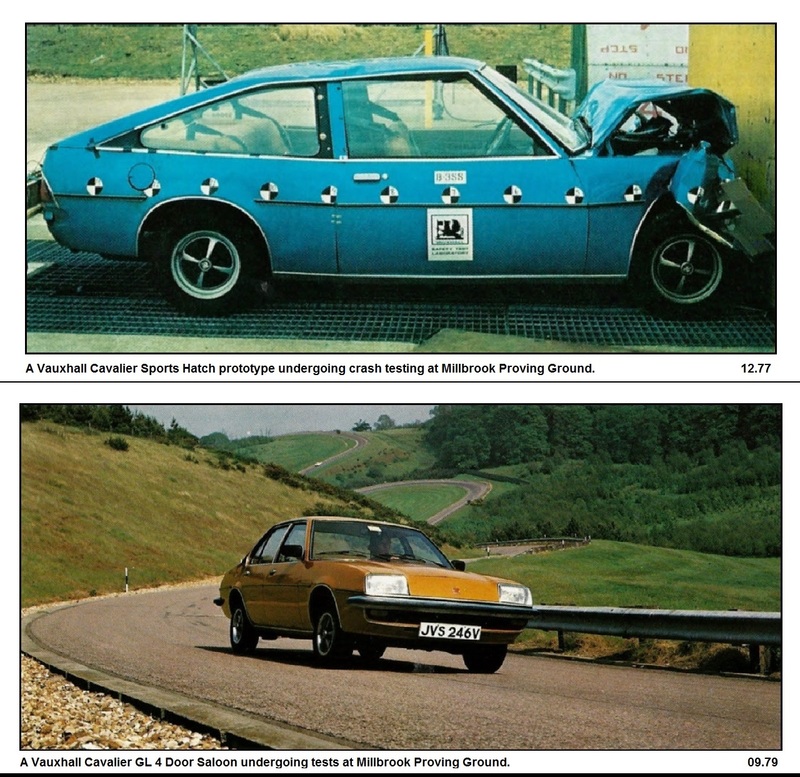 The Vauxhall involvement didn’t stop, all the type approval crash testing was carried out at Millbrook proving ground and the specific parts & pressings for the Cavalier Sports Hatch & Opel Manta Hatch were supplied by Vauxhall from the UK to both GM Continental & Opel in Germany. A similar arrangement existed for the specific parts used in the production of the Opel Kadett City. When the Vauxhall Cavalier Sports Hatch was launched in September 1978 it was the first time that General Motors had used a simultaneous pan-European launch by Vauxhall and Opel versions of a car. Unique to the Vauxhall launch was the use of the two Concept Cars from the Vauxhall Design Department in the publicity, Concept 1 and 2 even though Concept 2 was really the 3rd but there was no mention of this fact at the time. The Cavalier Sportshatch was launched with the 1600 and the new 2000 engines which replaced the previous 1900cc unit. The only trim available initially was GLS with either engine choice, but eventually a cheaper GL version was offered but only with the 1600 engine. Initially, the Vauxhall Cavalier range launched in the UK was made up of 1600L 2 & 4 door Saloons, a 1600GL 4 door Saloon and a 1900GL 2 door Coupe. The 1900 engine was listed as an option on the GL Saloon, not a separate model. All Vauxhall Cavaliers were built by GM Continental SA at their plant at Antwerp, whereas the Opel Ascona & Manta were built at either Bocham in Germany or Antwerp in Belgium depending on demand requirements. Comparisons between the specification of the Cavalier & Ascona are surprisingly difficult. Firstly, all Cavaliers were built with Vauxhalls 11-stage underbody protection process just as all other Vauxhall cars. The Opel Ascona was available in 3 trim levels – Standard, Deluxe & SR – the Cavalier L was positioned roughly between the Standard & Deluxe with the Cavalier GL between the Deluxe & SR, but the Standard Ascona only came with the 1600N engine giving 60bhp, all Ascona models were available in 2 or 4 door body styles. Like the Cavalier the 1900S engine was optional but only on the SR versions. The Manta came in Deluxe, SR & Berlinetta trims all with the 1600S engine, the 1900S was optional on SR & Berlinetta models. None were fitted with the Cavalier GL Coupe front air dam although it was used in Europe on the Manta GT/E. The Manta SR came with a naff looking bonnet painted black in the middle and along with the Berlinetta was fitted with sports instruments. The Cavalier GL Coupe was positioned just above the SR in price. In certain export markets the 1256cc engine was available in the Vauxhall Cavalier within months of launch, unlike in the UK, and in both L and GL trim, Saloon and the Coupe. Sweden was the only market where a Cavalier 1900GL 2 door Saloon was available. The original 1977 model year Vauxhall Cavalier range was little changed, the L models came with a twin painted coach line and the GL Coupe was renamed GLS and was fitted with full sports instruments. The 1900GL Saloon became a separately listed model. 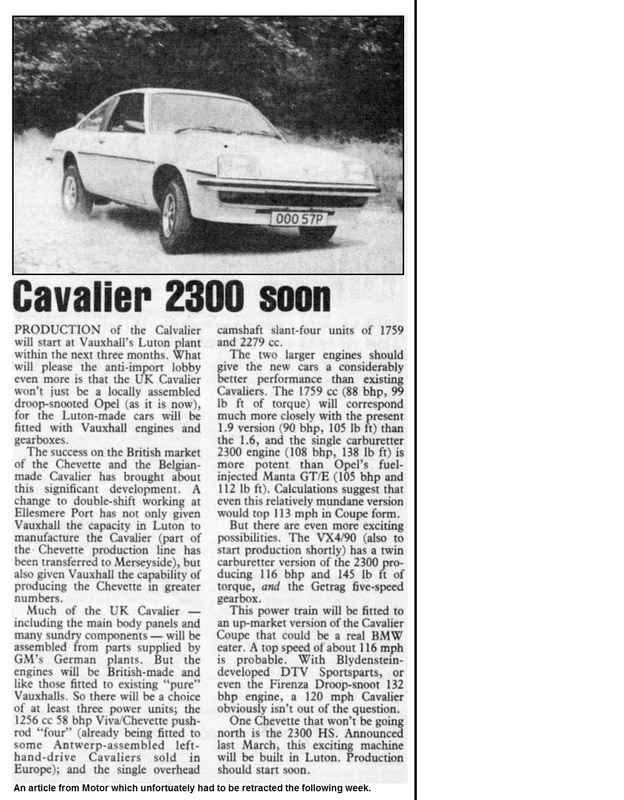 Later in the year, as agreed with the trades union, came the launch of UK production of the Cavalier at Luton with the first car coming off the line on 26 August 1977 driven by Eric Fountain Vauxhalls Manufacturing Director. 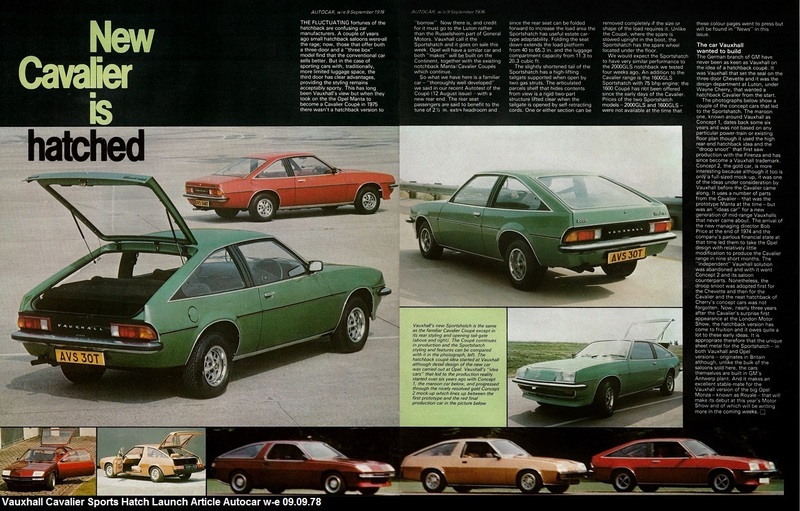 This also coincided with the British launch of the 1300L Cavalier 2 & 4 door Saloon using the familiar Viva / Chevette 1256cc engine but soon included the 1600 & 1900 versions, the only model never built in the UK was the Cavalier GLS Coupe which were all imported from Antwerp. Once full production had been reached Luton began exporting cars to Europe. It was at this time Vauxhalls marketing Department investigated offering a cheaper “E” model Cavalier following the same pattern as with the Viva & Chevette. The Cavalier E was to use vinyl trim, a de-chromed body with no coach line, 155x13SR tyres with a heated rear window an option. Cars were evaluated by several key fleet operators but the overall consensus was negative and idea was dropped. Apart from some slight changes to colour choice the 1978 model year Cavaliers continued unchanged. Announced in August 1978, the 1979 model year Cavalier range was extended by the addition of two new GLS Sports Hatch models with either 1600 or the new 2000cc engines. The new 2.0litre engine also replaced the 1900cc unit previously fitted to the GL Saloon models. GL models came with new ribbed velour trim while the L used new bright plaid cloth upholstery. The choice of exterior colours was revised. In July 1979, the 2000GLS Coupe was withdrawn. To coincide with Vauxhalls national marketing, a type of Vauxhall roadshow called "Vauxhall enter the 80’s" was rolled out to various locations around the UK from January to May 1980 and was a mixture of trying to sell cars and light entertainment with Ted Rogers of "321" television fame. 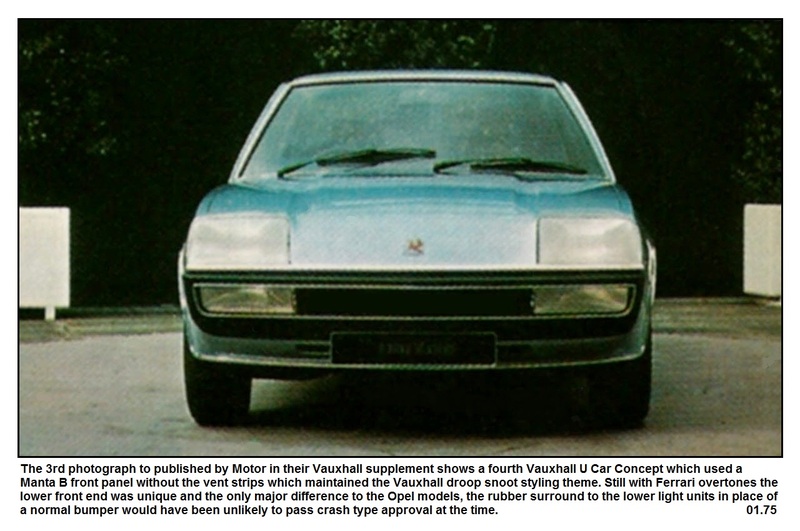 The idea was the dubious brainwave of the then head of Vauxhall's Marketing Department - Des Savage. Unfortunately, Des Savage was to marketing what North Korea is to a healthy diet! The lavish performances cost a huge amount of money, which Vauxhall didn't have at the time, and resulted in very few extra sales. Dealers were supposed to issue invitations to prospective customers but most just took their friends & family for a freebie night out. Epic fail. In June 1980, another trim level was added to the Cavalier range - the 1600 & 2000LS. Claimed by Vauxhall to be nearer in spec to the GL and in price to the L. At the time, GL models were then fitted with front head restraints. The final year of Cavalier production saw another hike in specifications across the range. L models were trimmed in Valencia velour, fitted with a push button radio, trip speedo, clock, a wide band coach strip and like all models halogen headlights. The LS added a passenger door map pocket. GL models included sports instruments. The top range GLS trim now included Laminated windscreen, locking fuel cap, remote control driver’s door mirror & a passenger door mirror, mono radio – stereo cassette and a tailgate wash / wipe on the GLS Sports Hatch. As part of an advertising campaign by Vauxhall Motors called Command Performance a special edition Cavalier 2000GL was produced which was fitted with tinted windows, remote control door mirror, body side stripes and special Command Performance badges. Vauxhall Cavalier MK1 production ceased at the end of July. The name Centaur comes from the Greek Κένταυρος, Kéntauros or hippo-centaur, and is a mythological creature with the head, arms, and torso of a human and the body and legs of a horse. As a choice of name for a sporty, well-engineered, attractive, sleek convertible car it didn’t really suit the Cavalier. It was, however, a name that General Motors held on their portfolio of car and truck nomenclature and was first used in the US on a Design Concept vehicle called the GMC Centaur for which it was quite an apt name as can be seen in the photograph. Crayford Auto Developments, with a workshop based in Westerham near Sevenoaks in Kent, had built up an enviable reputation for modifying all sorts of cars; from Fords to Mercedes, some with highly tuned engines, some with stretched chassis but most of all for convertible conversions. Their first foray into the General Motors stable was an up-market version of the Vauxhall HB Viva called “Prince” which was a sales flop. The second attempt using the same car was more successful, the HB Viva convertible. These models are now very rare and highly collectable. Full details of the Viva Convertible can be found on another page of vauxpedia.net. The next GM car that Crayford were involved with is almost forgotten today and was a chopped roof version of the Opel Commodore A 2 door Coupe, only one LHD prototype was made at Westerham in 1970 and was photographed outside of Crayford House, the home of Crayford’s Managing Director David McMullan. Motor magazine at the time ran a small piece claiming a sole UK concessionaire had been appointed in East Grinstead but this never came to anything and to my knowledge no Opel Commodore or the similar Rekord C convertibles were sold in the UK, it certainly was never advertised and the prototype was sold on to Deutsch Coach-builders in Cologne Germany. 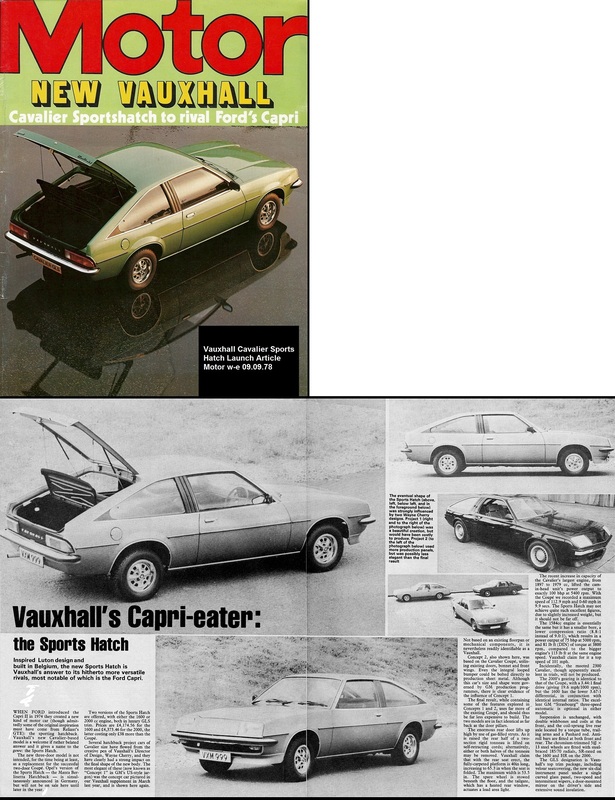 When the Cavalier Mk1 was launched in 1975 it was an instant sales hit and as discussed elsewhere on vauxpedia.net Vauxhall were far more involved in the development and design than most people give Vauxhall credit for. 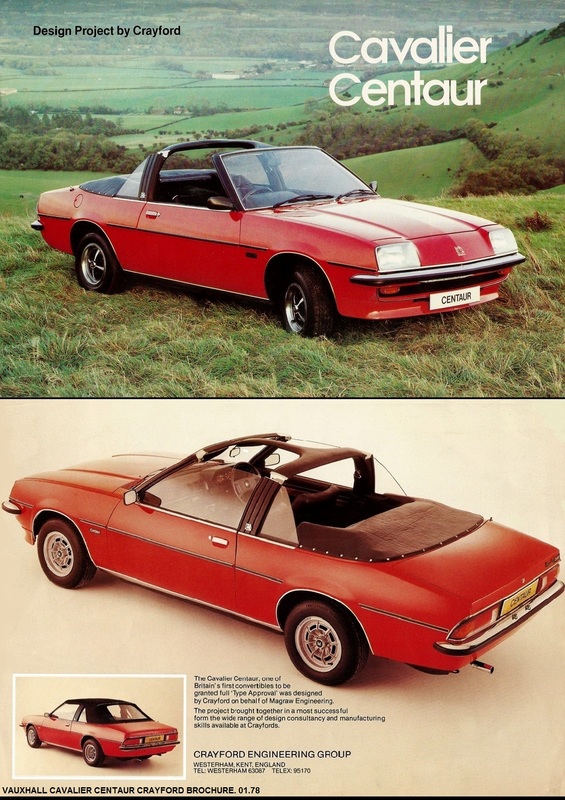 Late in 1976 the Luton Design studio had produced a concept mock-up of a Cavalier Convertible based on the Coupe body-shell, remember it was also around this time that Vauxhall had the two Chevette Saloon Convertibles built. No further work was done on the Convertible idea and attention switched full time to what would become the Cavalier Sportshatch. David McMullan at Crayford had many contacts throughout the motor industry and one of these was David Butlion of Vauxhall who worked in the Engineering Department at Luton and would rise to become a senior Director at Vauxhall in the mid-1980s. He had seen the Cavalier mock-up and thought it was a shame that the project had just died. In brief, following discussions between Vauxhall and Crayford set up by Butlion, the pictures and exact dimensions of the mock-up were released to Crayford who then went on to produce a fully fitted working prototype late in 1977. In a further story twist in 1987 David McMullan decided to retire and the Crayford Company, whose biggest assets were the worldwide brand label and the Argo ATV franchise, was sold to a new partnership lead by David Butlion, by then a senior Director at Bedford Truck and Bus Division. The Argo made Crayford the world’s largest supplier of ATV machines outside of North America. In 1989 David Butlion sold the business and left to develop a new sports car with an ex Vauxhall designer. They set up a factory in Devon to build a sports car like a Lotus 7 on Steroids called a Merak. They made only 6, all sold in Germany & Japan, before David Butlion ran out of funding and had to wind up the company in 1993. He and his family had to sell their home in Harpenden and move back to South Africa after 16 years in UK. 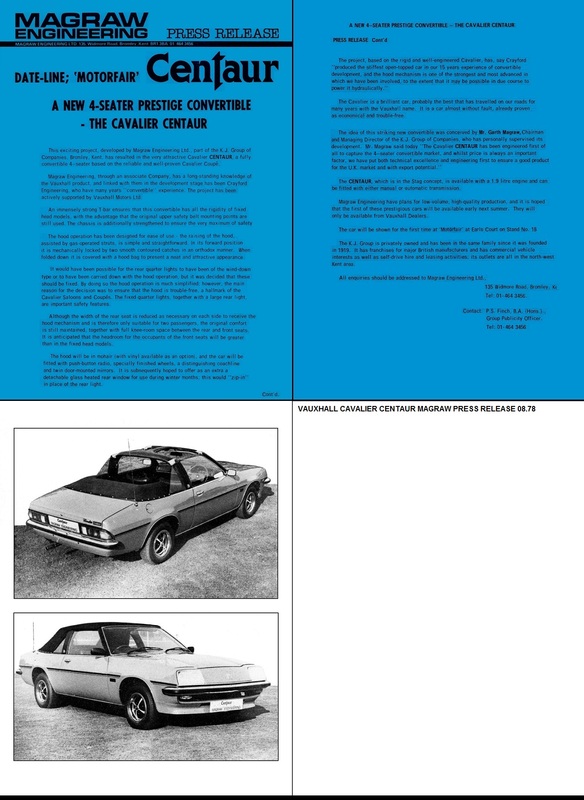 Crayford announced the Cavalier Centaur to the press in January 1978, based on the Vauxhall Cavalier Mk1 1900GLS Coupe along with full UK Type Approval and fully backed by Vauxhalls factory warranty. The projected cost at announcement was £7,103, of which £2,808 was for the conversion but if automatic transmission was specified or Campagnolo magnesium alloy wheels the cost could break the £8k barrier. Although expensive, as a full size 4 seat convertible it had little competition, even at the price. The conversion was also made available on the similar Opel Manta but only 2 were ever produced. At the same time of the launch it was confirmed that Magraw Engineering Ltd would build the car under licence to Crayford at their workshop in Mumford near Plymouth. Magraw Engineering had employed a lot of the skilled workforce made redundant after Mumford Conversions Ltd had gone bust some months earlier. Magraw also had ties with the large Vauxhall dealer chain, KJ Motors Ltd, but the car could be ordered at any Vauxhall dealer who would then purchase the car direct from Magraw Engineering Ltd. By the time sales started the 2000 engine had replaced the 1900 unit in the Cavalier, only the original prototype car used the smaller engine. 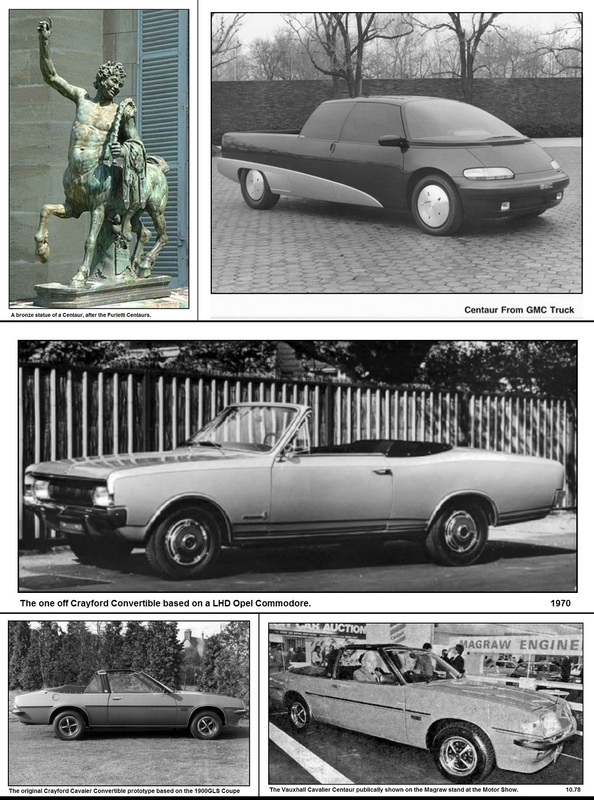 The Cavalier Centaur was first shown in public by Magraw Engineering on their stand at the London Motor-Fair in October 1978. The Centaur employed an immensely strong T-bar and strengthened floor pan to ensure rigidity which also meant the original upper seat belt mounting points could be retained. Fixed rear quarter lights were used to make the hood operation easier to use and, when folded, was neatly covered with a hood bag. Fixed rear quarter glass also ensured good all-round visibility when the hood was up and offered draught protection for the rear passengers when folded down. The hood operation was assisted by gas operated struts and was made in mohair with vinyl available as an option. The Centaur was fitted as standard with a push button radio and twin door mirrors, a Centaur badge on the front wings and a Griffin badge on the B post moulding. 5 1/2J x 13" Rostyle wheels with special “M” centre caps were standard, while Campagnolo alloys were an expensive option. The interior trim was the standard velour trim of the Cavalier GLS in either black, blue or beige. Each vehicle carried its own commission number in the glove compartment. 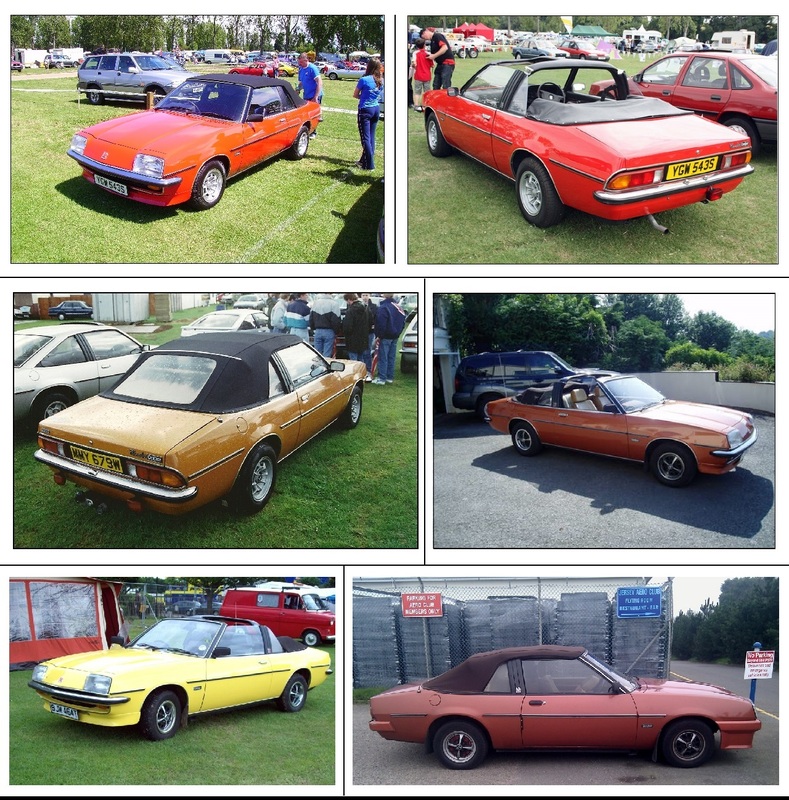 In total 118 examples were produced until Vauxhall deleted the Cavalier Coupe at the end of the 1979 model year when Centaur production stopped at the same time.